Clinging to a 9-8 lead with two outs in the top of the sixth inning, first baseman Ashley McCart smacked a grand slam to dead center and helped the Cerritos Legacy to a 13-10 win over La Mirada’s Gold team last Saturday afternoon. Photo courtesy 10-Under team. 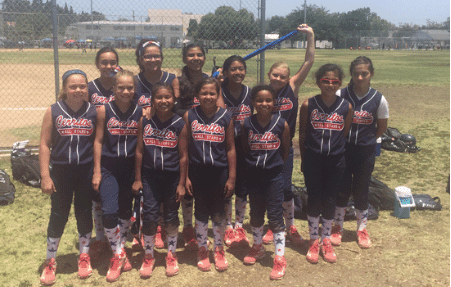 LONG BEACH-The shot that was heard around Bancroft Middle School during the Amateur Softball Association Los Angeles/South Bay “B” District Tournament was the one that put the Cerritos Girls Softball Association 10-Under All-Stars in the ASA “B” State Tournament. Clinging to a 9-8 lead with two outs in the top of the sixth inning, first baseman Ashley McCart smacked a grand slam to dead center and helped the Cerritos Legacy to a 13-10 win over La Mirada’s Gold team last Saturday afternoon. The Legacy would lose to Long Beach Heartwell 7-2 this past Sunday morning, but the celebration of going to the state tournament was still lingering. The grand slam was even sweeter considering it was McCart’s 11th birthday and through the first three games of the district tournament, McCart was batting a blistering .777 with nine runs batted in. Cerritos took a quick 2-0 lead in the first inning when McCart tripled in courtesy runner Haley Ceron, then came home on a groundout from catcher Chanel Madrid. The lead increased to 5-0 in the next inning when center fielder Natalia Hill scored on a wild pitch, right fielder Makayla Vanosse scored on a groundout from shortstop Catherine Quibrantar and second baseman Michelle Meza scored on an error. After La Mirada rallied to score six in the bottom of the second, Cerritos regained the lead in the third on a groundout from left fielder Maya Torres, plating McCart, and a triple from Vanosse, allowing Hill to come home after she was walked. La Mirada would tie the game at 7-7 in the fourth before the Legacy pushed across a run in the fifth on Hill’s two-out single, bringing in Ceron. Cerritos was looking for the win but with two outs in the bottom of the fifth, Amanda Urbina singled, stole second on the third pitch thrown to Sammie Orozco and came home on a pair of errors. Now, playing under international tiebreaking rules with Hill beginning on second, Vanosse moved her over on a groundout and a bases loaded walk issued to pitcher Bella Bulthuis made it 9-8. Up came McCart and after working to a full count, she smacked the grand slam. It was a big hit for multiple reasons because La Mirada’s Marley Cortez singled with one out to score Orozco. Then with two outs, a triple from Jaiden Delatorre allowed Cortez to score the last run of the game. On the very next pitch, Rossy Gonzalez grounded out to end the game. The Legacy began the districts with an 11-3 loss to Long Beach Heartwell last Friday afternoon as McCart went two for two and Madrid belted a two-run home run in the top of the fifth. The next morning, Cerritos stayed alive in the loser’s bracket with a 10-2 win over Santa Monica. McCart went two for three and drove in four runs while Quibrantar also had a pair of hits and scored three runs. Bulthuis was solid in the circle, going five innings, scattering five hits and striking out four. The last game for Cerritos saw the Legacy score its two runs in the top of the first as a single from Bulthuis plated Quibrantar and McCart later on came home when catcher Natalia Sanchez was safe on an error. But Long Beach Heartwell answered with four runs in its half of the frame and added two more in the second. This is the first time since 2012 that a CGSA 10-Under All-Star team has moved on to states and fifth time overall. The Legacy are also on somewhat of a roll, going 2-2 in its last two tournaments after a 1-8-1 start to the summer, thus lifting a load off the shoulders off of Medina and his team. Despite the team pounding out 24 hits in the four games, the one area that needs to improve on the most is the defense. In the four games, the Legacy committed 20 errors as opposed to the 13 from its foes. The two other players on the Legacy are Alea Medina and Brynn VanderWal, who pitched the first two innings of the second game against Long Beach Heartwell. The coaching staff consists of Cedric Hill, Jack Molina, George Molina, Tony Torres and Jeff Vanosse. The team mom is Natalee Molina. The CGSA 8-Under All-Stars, who by far were the best of the four Cerritos teams this summer in terms of wins and losses, also advanced to the state tournament and like the 10-Under All-Stars, they too won their first game, rallying for a 3-2 win over La Mirada’s Gold team last Friday afternoon. The CGSA 8-Under All-Stars, who by far were the best of the four Cerritos teams this summer in terms of wins and losses, also advanced to the state tournament. Alyssa Hensgen was throwing a no-hitter through the first three innings and had allowed one runner to reach base of the first 12 she faced. But with two outs in the top of the fourth, she walked Sophia Hernandez, who then scored on a four-base error on a bunt attempt from Aubrie Barugh. Alyssa Hensgen would finish the game allowing one hit and striking out 10 batters. Meanwhile, the Shockwave scored its first run in the bottom of the fourth when Emily Vargas singled to the right field gap, scoring Kalie Matsuno. In the next inning, Kayleigh Sutton reached on an error, stole second, moved to third on a wild pitch and tied the game when Anaya Granflor was safe on a bases loaded error with two outs. Alyssa Riley would score the game winner when she came home on a bases loaded walk issued to Taylor Martinez. Cerritos was issued five walks and was limited to two hits-one from Vargas and the other from Mia Tapia. The Shockwave fell into the loser’s bracket after a 4-0 loss to Torrance last Saturday. All four runs came in the bottom of the second and Cerritos had just one base runner, a one-out walk issued to Nevaeh Leon Guerrero in the third. Cerritos came back later in the day to edge Pico Fastpitch 2-1 with the game-winner coming in the top of the sixth. Granflor would come home on a one-out groundout from Alyssa Hensgen. Tapia went two for two and scored in the second inning on a groundout from Danielle Baca. The Shockwave would then be on the south side of a 2-1 decision to Downey this past Sunday as it was held to three hits. The lone run came in the top of the fourth when Tapia drove in Matsuno with a one out single. This is the fourth time that a CGSA 8-Under All-Star team has advanced to the state tournament and the team is currently 11-7-2 in five summer tournaments, winning the South Huntington Beach Tournament the first weekend in June. Ava Ceron and Dalani Cooley are the other two players with Brent Matsuno, Jen Riley and Ed Sutton as the coaches. The team mom is Eleanor Granflor. 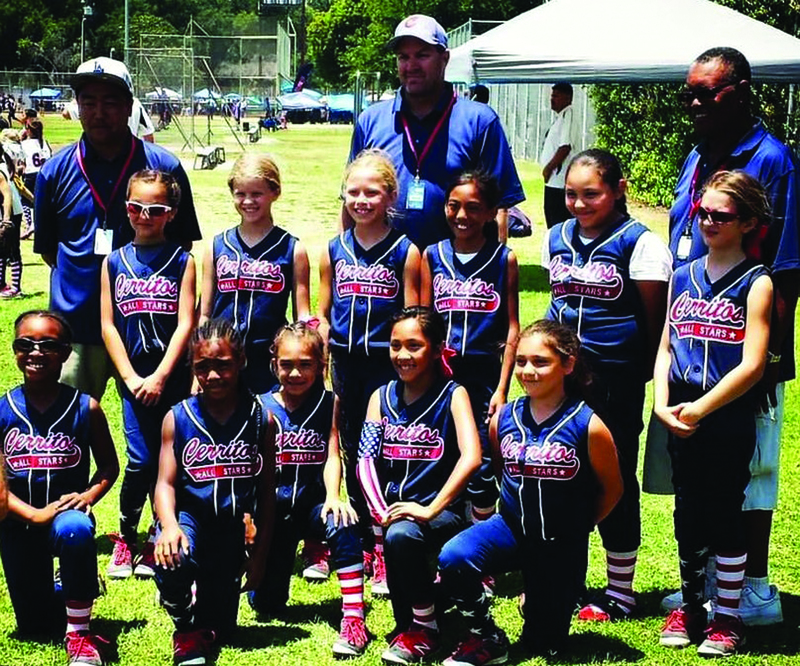 Both the 8-Under and 10-Under All-Star teams will begin the state tournament on July 8 with games through July 10 throughout the Lancaster/Palmdale area. The opening ceremonies will take place at 7:00 on July 8 at Jet Hawk Stadium. A summer that saw the CGSA 12-Under All-Stars win one game in five tournaments and make a managerial change midway through the season ended with two resounding losses in the district tournament. The Elite was crushed by the Torrance Silver team 17-2 last Friday, then was eliminated by Santa Monica 13-5 last Saturday morning. Against Torrance, both runs were scored in the top of the third. Alexa Diaz singled and stole second. Mya Veliz was then walked and both runners stole third and second respectively before coming home on a base hit from Isabel Navarro. Against Santa Monica, the Elite was trailing 8-0 before scoring four runs in the bottom of the fourth. Diaz, Navarro and Veliz all singled with Diaz scoring the first run. Then with two outs, Sarah Ochoa singled and Dy’Mond Manzo, who drove in three of the five runs, was walked. Two innings later, Ochoa doubled home Veliz, who had three hits. Diaz, Manzo and Ochoa would all collect a pair of hits. Despite the long season in which Cerritos scored 35 runs in 14 games, Duenas was still optimistic about the summer. The rest of the 12-Under Elite all-stars are: Chelsea Azevedo, Daniela Barron, Katelyn Colvin, Alexis Duenas, Breanna Lucero, Natalyn Membreno and Adrina Urias. The coaches were Gabe Azevedo and Jonny Shaffer and the team mom was Ana Azevedo.